Wed, Apr 24, 2019 6:30 – 8:30 P.M. Meetings are held the 4th Wednesday of each month, from 6:30-8:30. Please note that everyone is welcome to attend our club meetings. Anyone interested in joining us for a Day Hike before should sign up at a meeting or contact us at thewoodlandshikingclub@gmail.com. If you are reading this and wondering whether hiking, camping, or backpacking is for you, there is no better way to find out than to join us for one or two activities. You will learn quickly which activities you like, and you will have a good time with some really fun people at the same time! Please note that everyone is welcome to attend our club meetings. Anyone interested in joining us for a Day Hike before should sign up at a meeting or contact us at thewoodlandshikingclub@gmail.com, and check out our newsletter by clicking on the NEWSLETTERS link in the left menu. If you would like to join us for a Day Hike before you can come to one of our meetings, also send an email that you are interested. WHERE do our members live? Check out this map to see. 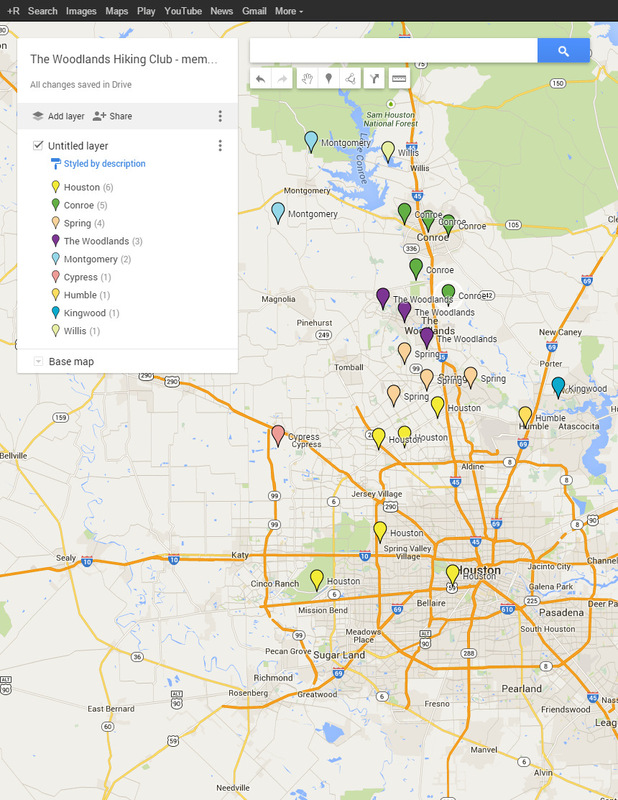 Our members come from a wide range of communities in the Greater Houston area. The 4 most represented communities are The Woodlands, Conroe, Spring, and Houston. We also have members from Montgomery, Cypress, Willis, and Kingwood. We are also adding a webpage on general hiking related information. Check it out at <Hiking Info!>. AND we have just added the March Newsletter, look to the left! The Woodlands Hiking Club, a group of enthusiastic hikers and campers committed to enjoying the outdoors, was officially organized in 1983. While most of our members are from The Woodlands and surrounding areas, we also have members in Sugar Land, Georgetown, and Arlington. A day hike is usually scheduled for a Saturday morning once a month at a local trail, park, or nature center. We normally camp one weekend a month at a Texas state park, hike Saturday, and enjoy a pot-luck dinner on Saturday night; or sometimes we go to a local restaurant. We do not have regular campouts during July, August, or December. Some members have travel trailers and some have tents. Once in awhile, we stay at a motel. Each year the club plans hiking and camping trips to meet the interests of its members. There is something for everyone – local day hikes, weekend trips with short day hikes, or an adventurous week-long backpacking trip to places like the Rocky Mountains, Yellowstone, Grand Canyon, or Big Bend National Park. The Club occasionally plans more exotic trips. Over the past several years, trips have included Alaska, Peru, England, Mexico, and France. In August 2009, a couple of our members went llamapacking in Colorado near the Continental Divide. In December 2009, several members once again went to Big Bend National Park to spend a week at one of the club’s favorite places. In October 2011, we went to Great Smoky Mountains National Park; and in September 2012, a group traveled to Taos, New Mexico. In March 2014 the club spent a week in glorious Big Bend National Park, enjoying more than 8 hikes totaling more than 25 miles. Visitors are always welcome to attend our meetings. We meet on the first Wednesday of the month except we do not meet in July, August, or December. We meet at the Spring Creek Greenway Nature Center, 1300 Riley Fuzzel Road, Spring, TX; and meetings begin at 7:00 P.M. Our newsletters from the past year (see tab at the left) will give you a good idea of our activities, and the most recent newsletter will have up-to-date contact information and any changes in our meeting day and location.